Scroll down and see the May photo of “The Runt” tomato plant and the next photo is June 28. It’s growing! May: Follow the wooden stake to the dirt. You will see a small tomato plant. I call this hopeful or confident because my husband put that large tomato stake next to this tiny tomato plant he calls a runt. I’ll keep you updated on its’ progress through the summer. Should be fun to watch! We know honeybees produce the sticky, sweet nectar that we spread on toast or pour into recipes. More than 4,000 species of bees are native to North America. Some consider bees pests. Some unwittingly kill the good bugs and bees while using broad methods to kill true pests. It’s important to know the difference and how and why to prevent extinction of the tiny things that matter. Todd Amacker wrote of the pollinator experience at Great Smoky Mountains National Park: “Honeybees alone contribute over $14 billion to the value of U.S. crop production. It turns out that bees need to collect both pollen and nectar in order to stay alive. Like all living things, stress plays a role in their health. “All bee species face similar stressors — poor nutrition due to a lack of flowers or monocropping (the practice of growing only one type of agricultural product in a large area of land, year after year), pesticide exposure, parasites and diseases,” said Phyllis Stiles, director of Bee City USA, a certification program that helps pollinator populations. What can the home gardener do to help? He or she can go natural and create a yard that welcomes bees and butterflies. “Insecticides that kill pest insects are likely to kill bees, too,” Johnson said. We can eliminate pesticides or use safer ones, such as Bacillus thuringiensis, or Bt. We also can choose plants from local nurseries that don’t treat seedlings with neonicotinoid pesticides, which kill all insects and bees by attacking the central nervous system. Johnson said one easy tactic is to mow less frequently. “Letting clovers and dandelions bloom is probably the easiest strategy for providing bees with food,” he said. Jerry Hinton of Hinton Apiaries in Grove City said heirloom plants, those that have not been altered to fit snugly into a garden, are more beneficial to pollinators. Johnson said to read the label for warnings. Sounds like good advice for more than gardening. Kermit the Frog, from the children’s show, Sesame Street, made the phrase, “It’s not easy being green,” popular. Today it is easier to be green than ever before and has quietly become an everyday event, less a social statement than a way of life. Recycling is not new, as archaeologists have found evidence of it as early as 400 B.C. What we recycle has changed from turning brass coins into statues to disposable material, but not exclusively. Before mass production, it was cheaper to reuse than buy new. When we got married April 22, 1978, I had no idea that was Earth Day and had been since 1970. It’s appropriate as I married a man raised on a farm and I always considered myself an outdoor girl. I’m a fan of being responsible and taking care of what I have. I try not to obsess, just keep our home tidy. Years ago, our son saw me sweeping the front porch at a home we’d recently moved into. “You really like this house, don’t you?” he said. Yes was my answer. How did he come up with that? Likely it was because I was taking care of the house, wanting it to look its best. He knew I liked to sweep — don’t ask me why, I just do. I never asked him but I was amused at the time, and the memory makes me smile. After a hard winter, our new seedlings are growing tall in their temporary home in the basement. Little tufts of green hold promise of plants. We are planning where to put everything again this year, rotating from last year in our smallish backyard. I’m ready. Thanks to a neighbor, we obtained a composting bin he no longer needed. This year we’ll have some really black, rich soil to add to our ground. After we plant our garden, we will care for it by watering, weeding and adding natural nutrients. Our reward will be harvesting fully grown vegetables literally ripe for the picking. I am eager for those days again this year. I’ve always been a proponent of taking care of our earth. I’m no expert and can’t claim that I know where or how our planet’s environment will progress. But I know that I can take care of my little section by responsibly recycling, educating myself on what we put on our lawn and garden, and not adding to any kind of pollution. The website growingagreenerworld. com is a great resource. Again, I don’t obsess or think that catchphrases make up the whole of our world. Our air is cleaner than many other parts of the world but sooner or later, we all share the same air. It’s not as if we can block the borders in the air. Our youngest grandson always lets us know of the best movies — often animated. He told us about WALL-E (short for Waste Allocation Load Lifter Earth-Class). The story is a worst-case scenario for the people on earth who didn’t get pollution, materialism and waste under control. WALL-E is a sanitation robot whose best buddy is a roach. Interesting the makers of this movie chose that as the only living thing left on earth. WALL-E spends his days collecting, compacting and piling trash, almost like building blocks. In this movie, mankind’s current home is a giant spaceship where humans float on personal hovercrafts, interact with others via screen phones and have grown so obese and sedentary that they’ve forgotten how to walk. Because of WALL-E and another robot, who find a green plant which signals it’s time for humans to return to earth, a chain of events occur that puts people and the planet back on a healthier path. It makes me think we should use up and use wisely our material possessions instead of buying frivolously simply to have new items. I’ve always liked using cloth and canvas bags for most shopping, yet I don’t always succeed. I’m glad most stores have reusable bags available for purchase. Noticing our stockpile of plastic bags, I remembered a story of people who use them to make mats for the homeless. After finding the instructions, we gathered our bags, my husband cuts them in strips, I weave into “yarn” and crochet small mats to use when we’re camping. But more than anything, I love our earth and will continue to take care of my little corner. We each can do that because, unlike poor Kermit, it really is easy to be green. “Baby, it’s cold outside” is an appropriate phrase, whether sung with the familiar tune or spoken, from December till early spring in Ohio. By now, and definitely by February, we are ready for sunshine and weather warm enough to step outside wearing only a light jacket. Of course, the joke goes, in central Ohio, if we wait 10 minutes the weather changes. The branches of the winter tree, wave in the wind, alone and free, reaching up towards the sky, the foreground of sunsets, orange to the eye. Each tiny branch can be easily seen, for the leaves of cover have fallen and died. The tree seems to have lost any real purpose, naked and cold and seemingly worthless. But the sap is waiting for the warmth of the sun, to rush through the branches to bring life to what seems done. Then once again all the leaves will grow, and the tree will survive, as it has since long ago. Regeneration in nature is a true miracle. Springtime teems with new life but in winter, I see hidden hope because I know the sap is running inside the trees and roots underground are waiting to sprout, showing new growth. 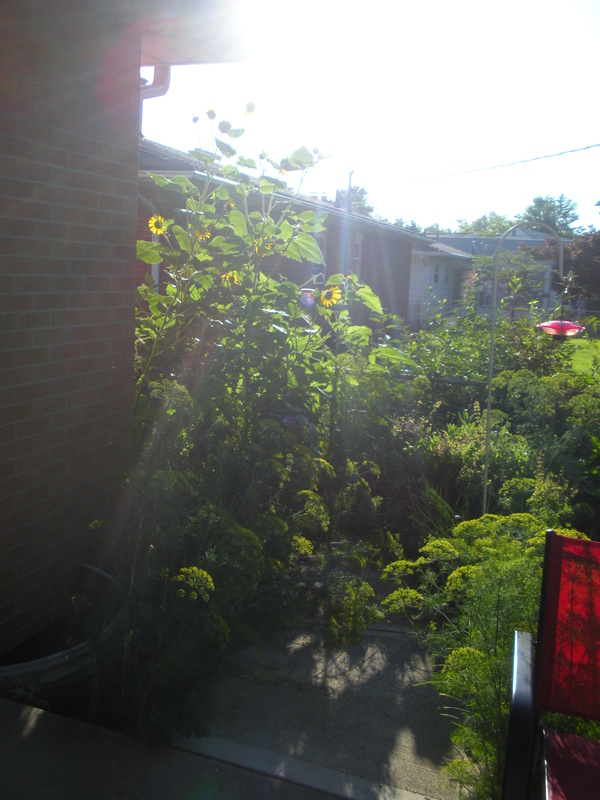 Several years ago, we had a sunflower, which we never planted, grow more than 6 feet tall in our garden. Thank you birds. The next year, we had a long row of sunflowers looking for all their worth like a neatly planted garden of flowers. But we never planted any of them either. They had multiplied themselves with the help of more of our feathered friends, dropping seed along their flight. The next two years, not a single sunflower. Then they came back with a mighty force, giving me plenty of cutting to do so we could walk along the sidewalk. I laughed when I bought a bag of wildflower seeds and saw sunflowers listed. When I planted those in another spot than our volunteer sunflowers, sunflowers did appear with different varieties I’d never seen. Who knows what we’ll see come spring, but the anticipation is fun. I was watching an episode of Growing a Greener World (growingagreenerworld.com) on WOSU (Columbus, Ohio) about this topic. A horticulturalist and propagator was showing how to generate new growth by starting new plants from cuttings. She said that plants’ and trees’ only missions are to propagate with a need to duplicate as a matter of survival. She used the oak tree dropping “buckets full” of acorns to make new trees as an example. Our small but healthy oak tree did that very thing this year for the first time. Thankfully, squirrels collected them for us. Most years, I save seeds from my zinnias and marigold flowers. The seeds from last year, once blooming, looked different this summer. In addition to growing taller than me, some of the zinnias were multiple colors, with colors, like pink, I’d never seen before. Some had large flowers while others were almost tiny but packed with vibrant color. Then I learned that when seeds are saved and sown from hybrid plants, the plants grown from those seeds tend to revert to the original plants. A little confusing but the result was remarkable and lovely. We are already planning our garden for this year. Seed catalogs will soon be here and as the snow blows and wind howls, we will map out what and where to plant. We’ll set up our mini-greenhouse in the basement and start tomatoes, peppers and cucumbers. It makes the possibility of spring seem closer and expectations an ongoing gift. The idea of regeneration gives the bleak winter, with hidden treasures waiting for spring sunshine to reveal new growth, more promise. Once the winter season is behind us, we are renewed and ready to get planting. I think we need times to wait for fresh purpose to stir within us. The branches of the winter tree set an example for you and me. When all purpose seems to be gone, we can remember the seemingly barren tree. It knows that soon the spring will come and winter’s cold harshness will be done. We must persist, as the lonely tree, and wait for new life to set us free.